Toronto Bars with Darts, Patios, Pool, WiFi, UFC, Trivia & Wings! The 3 Monkeys Eatery: Restaurant Quality Food at Pub Prices! The Fox & Fiddle Leaside: Voted Best Pub (Toronto Sun Reader's Choice Awards) 2009! A.C. Ranch Cafè: The only bar of its kind at St. Clair and Dufferin. Le Spot Billiard Lounge: Scarborough's premier bar for pool & darts! Scotland Yard: Definitely worth investigating! Visit Our Dart Store Downtown!!! The Only Specialist Dart Store in the GTA, and the only place to buy a wide selection of darts and supplies in the downtown, we are hoping to see you. Want to have your league's stats hosted here? About every month (less in summer) we send out our newsletter that's packed with local darting news, tournament dates and lots of free stuff. 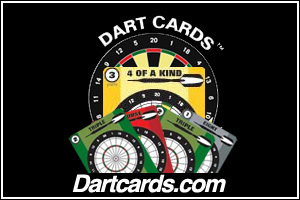 From the forum: Players like you talk darts! Want to know how many people drive to league night? What percentage of players believe darts is in decline? Check out our live polls. You can even vote yourself! This forum is for last-minute updates about tournaments happening in Ontario and other parts of Canada. Here you'll find a discussion, sometimes contentious, over the best way to finish '01 games. We recently created a poll where we asked players if they would play in a cricket only league. After a week of polling and 150 page views, we had our answer: 2/3 of player who responded to the poll said Yes.